I’ve always had an issue with keeping track of the stuff I need to get done. So I was quite interested in an article by Daniel Markovitz over at the Harvard Business Review titled titled To-Do Lists Don’t Work. While I do not agree with everything stated, he does bring up a lot of good points. His actual advice, “living in your calendar”, has its own problems associated with it, but the whole article brought up enough ideas that I’ve decided to write about what I use here. This is my main, day-to-day way of keeping track of tasks. I have a number of Field Notes notebooks that I keep both at work and at home, and I write down anything I need to get done in there that isn’t a long-term task or part of a long-term project. I also write any notes down in there at meetings which I will then transfer over as soon a I get back to my desk or computer. I’ve found it to be the most frictionless way for me to get down what is needed and move on. I’ve tried a number of different pens and really haven’t settled on just one to use, but I prefer black ink. For longer-term projects I work with Things for Mac. I’ve tried other electronic task organizers and nothing really comes close for me. I also use Things for iPhone and have Things for iPad, but really don’t use it much since I moved to just keeping things in Field Notes notebooks that isn’t a long-term, need-to-use-my-MacBook-Pro, type of task or project. The most frustrating thing about using Things is that it doesn’t do over-the-net syncing yet. It has been promised, but it has not been delivered. So I use it mainly on the Mac and wait for a more complete experience for the future. I also use Reminders on my iPhone for lists of things, like groceries. While I could use it on the iPad as well, I just haven’t found a use. That’s about it. 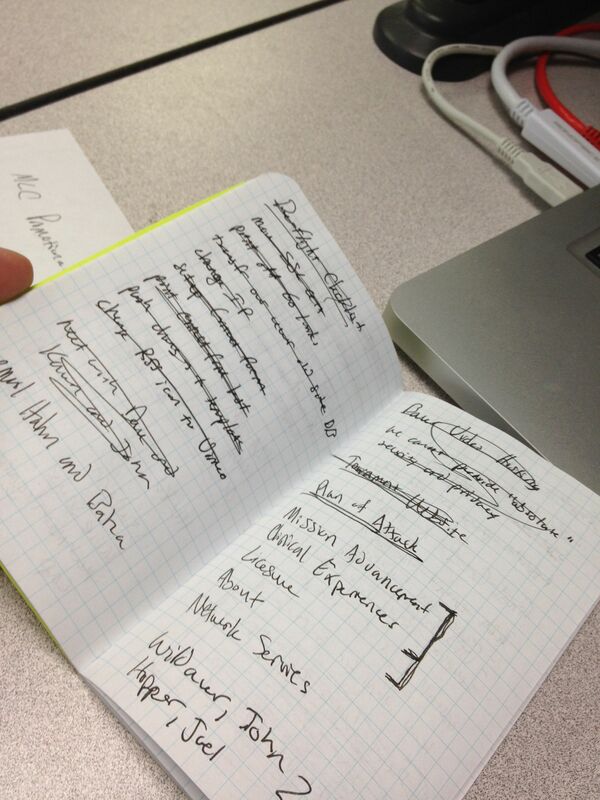 I don’t follow any crazy system, I just keep thing separated by the kind of project and then use notebooks for the rest. Sometimes what has worked in the past still works well in the future.